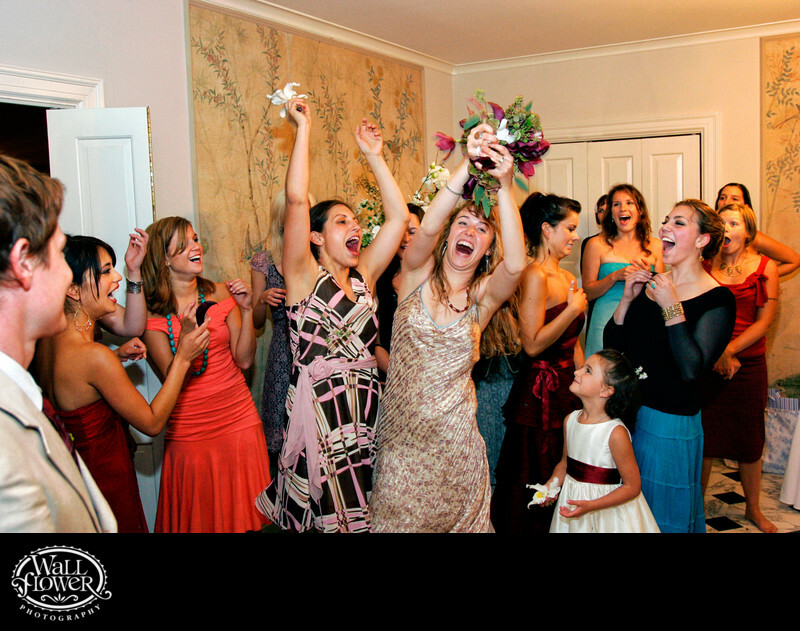 This bouquet toss took place in one of the smallest, most crowded rooms I've ever photographed a bouquet toss in! The room is the foyer of the Wagner House at Lakewold Gardens in Lakewood, Washington, which is a really cool room with a beautiful curving staircase that leads to the second floor. The bride was standing five or six steps up the stairs, and I was on the second one, pressing myself against the wall with a wide-angle lens on my camera. It's one of those photos that's fun to study and piece together the story of one single lady's contested catch, with her main competition coming away with just a single flower. Lots of smiles all around, and one bridesmaid trying to run the other way. To see lots of photos of this wedding, and of other weddings photographed by Wallflower Photography at this venue, visit our Lakewold Gardens wedding portfolio website at www.lakewoldgardenswedding.com.